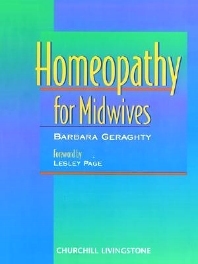 This is a concise introduction to homeopathy for the midwife (and nurse-midwife). It starts with a brief introduction to the principles of homeopathy and the use of remedies. It then presents a series of full page tables to aid the midwife in rapid and clear assessment of the client's needs, and the remedy most likely to be appropriate. The text aims to give a quick and clear set of options for treatment by homeopathy.